Armenia is hiring mercenaries from Lebanon and Syria for military operations, Azerbaijani Defense Minister Zakir Hasanov said addressing the command staff following large-scale exercises that involved all combat arms, according to the Defense Ministry statement for April 13. The minister is sure that the “occupied territories of Azerbaijan” will be released shortly. He praised President of Azerbaijan – Commander-in-Chief Ilham Aliyev for turning Azerbaijan’s Armed Forces in the most powerful army in the region having advanced weapons and military hardware. The morale of the manpower is growing day by day, he said. Hasanov said the provocation attempts of Armenians who suffered huge casualties in the last battles failed as armed forces of Azerbaijan prevented their repeated sabotage attacks. “Armenians are trying to conceal their losses, but we are well informed of the situation in the occupied territories. By our data received from various sources, including from the enemy, the situation in Armenia and in the occupied territories is poor,” the defense minister said. He claims that civilians are brought to combat positions in Armenia for lack of soldiers. In addition, foreign mercenaries, mainly from the Middle East – Lebanon and Syria – are involved into military operations. The Armed Forces of Azerbaijan are fighting against the “criminal military political regime in Armenia,” the leader of that country, but never against the people of Armenia, the defense minister said. Hasanov said Azerbaijani soldiers are ready to fulfill any order of the supreme commander and justify the confidence of the people and leadership of Armenia, Trend reports. “The only way to release Azerbaijani lands is final withdrawal of Armenian armed units from the occupied territories. Another alternative is use of force. The enemy must realize that and stop trying Azerbaijan’s patience,” the minister said. 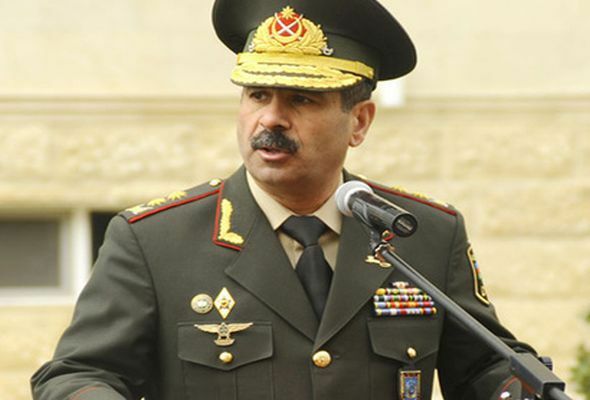 “The major task of the Azerbaijani armed forces is to be on alert and ready to destroy the enemy. We are always ready for that. Exercises and training of troops to upgrade the combat efficiency, professional skills and morale show that victory day is coming,” the minister said.